Many thanks for your posts - the first things I read every day. I have always been of the opinion that Thomas Cranmer very carefully changed the rituals of the church depending on what he felt he could get away with. But you have clarified for me that he took much of his theology from Zwingli and the Zurich reformers. Fr as you know Dr Lauren Pistras in her 'Collects of the Roman Missal' did a side by side of the collects for the entire year. Most of the new collects did draw on earlier material, usually an old sacramentary or patristic text or homily, but anything with too much 'pastorally difficult' mentions of sin and punishment in the hereafter for it, was heavily edited. Concatenation where old sacramentary text and new words of wisdom from the Age of Aquarius were stuck together was a major element of the New Order. Even where most of the words were of ancient origin, bad old things like sin were made to vanish. After all this hatcheting something of notable banality was the result, sad! as DJT might say if he were a liturgist. The revolution within the form of Catholicism required a new Lil' Licit Liturgy with lots of truncated prayers and striking omissions because it represented a striking rupture with the past; in fact it is, essentially, a new Faith that treats our past as though it were a toxic waste dump we should never ever go near. 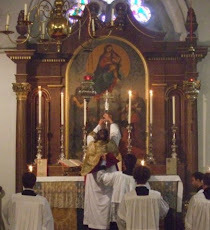 Were it not for his particular personal situation, ABS would never- NEVER - go to the Lil' Licit Liturgy because its existence reveals the men who created it and the men who say do not hold the Faith once delivered. It is always useful to, occasionally, compare the Real Mass prayers, beginning with Te Igitur to the Meal prayer of the Messias-Deniers which was substituted for it. If that alone does not convince any man that those who assassinated the glorious and beautiful Roman Rite and replaced it with the corpses of our enemies were/are the enemy of the entirety of Catholic Tradition, then nothing will. bold enough to call for an end to the malign machinations of the Modernists who wreck everything they touch. In any event, nothing says Catholic Tradition like assassinating the beautiful prayers of multi-millenial existence and replacing them with the meal prayers of those who deny that Jesus is the Messias.